JAXA confirmed the completion of a sequence of the important operations for the Hayabusa2 mission. 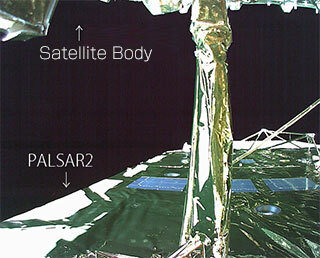 With this confirmation, the critical operation phase of the Hayabusa2 was completed. We would also like to ask for your continued cooperation and support for the long-term Hayabusa2 space exploration mission. Please send your support messages for the mission. 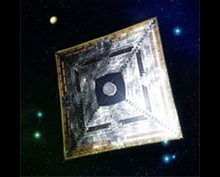 (you can send a message from Hayabusa2 Project page or tweet with hashtag #hayabusa2). The rocket flew smoothly, and, at about approximately one hour, 47 minutes and 21 seconds after liftoff, "Hayabusa2" was separated from the H-IIA F26. We will update you with the latest information on the "Hayabusa2" on the project page. The live launch report will begin at 12:25 p.m. on December 3 (Mon. ,JST). The report will be broadcast through the Internet. The 21st Asia-Pacific Regional Space Agency Forum (APRSAF-21) will be held at the National Museum of Emerging Science and Innovation (Miraikan) and the Tokyo International Exchange Center (both in Tokyo) between December 2 (Tue.) and 5 (Fri.) 2014. 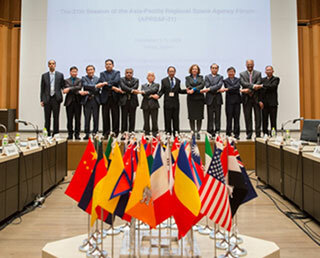 The APRSAF was established to promote space utilization in the Asia-Pacific region. The 21st forum will be held in Japan for the first time in nine years. At the forum, we will adopt a newly renovated “working groups” framework instead of the conventional space technology oriented conference to focus more on addressing and solving issues that the region faces. New movie "JAXA -Explore to Realize-"
The new video clip titled "JAXA -Explore to Realize-" was uploaded to the YouTube. This video introduces JAXA’s activities in its three pillar areas of “safety, security and disaster preparation,” “industry collaboration,” and “challenge to frontier” with some interviews with JAXA project personnel and users of JAXA technology. 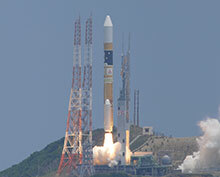 Tropical Rainfall Measuring Mission "TRMM"
"Himawari-8" lifted off for space! Launch Success of H-IIA F25. The H-IIA Launch Vehicle No. 25 with the Geostationary Meteorological Satellite "Himawari-8" onboard lifted off at 2:16 p.m. on October 7, 2014 (Japan Standard Time) from the Tanegashima Space Center. The launch vehicle flew as planned, and, at about 27 minutes and 57 seconds after liftoff, the separation of the "Himawari-8" was confirmed. The launch time of the H-IIA Launch Vehicle No. 25 was set at 2:16:00 p.m. on October 7. 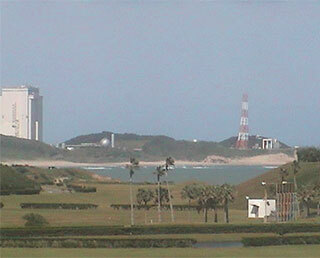 The live launch report through the Internet will start from 1:45 p.m. on the same day from the Tanegashima Space Center. Do not miss the Himawari-8's departure to the geostationary orbit. Your warm support messages are welcomed at the support site. 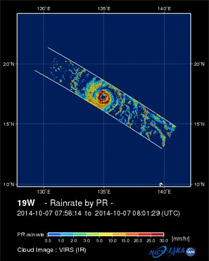 Public Data Release of the GPM Core Observatory. JAXA has started public data release of the Global Precipitation Measurement (GPM) Core Observatory, which is jointly developed with the National Aeronautics and Space Administration (NASA), since September 2, 2014. 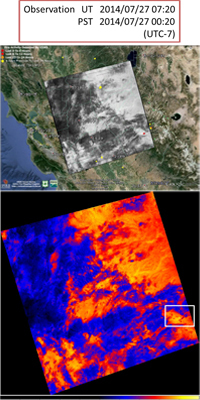 The GPM Core Observatory is focused on precipitation observation from space, and carrying the Dual-frequency Precipitation Radar (DPR) developed by Japan. Figure: 3D precipitation structure of Typhoon No.10 captured by DPR at 15Z on July 21, 2014. The launch schedule of the H-IIA Launch Vehicle No. 25 (H-IIA F25) has been decided to be between 2:16 thru 6:16 p.m. on Oct. 7 (Tue), 2014 (Japan Standard time). The launch will be performed by Mitsubishi Heavy Industries and JAXA. The H-IIA F25 will carry the geostationary meteorological satellite "Himarawi-8," which will be operated for observation by the Japan Meteorological Agency. The satellite is equipped with a world cutting-edge camera, thus it is the first launch of a next-generation weather satellite in the world. The Himawari-8 is expected to contribute to improving the accuracy of more meticulous meteorological observations and weather predictions such as typhoons or localized downpours as well as weather forecasts in Japan and East Asian and western pacific countries. In addition, it is envisioned to play a significant role in broader fields including disaster preparation and the Earth's environment monitoring. The DAICHI-2 was launched on May 24, 2014, and it is currently underinitial functional verification. The images were captured during the verification stage. 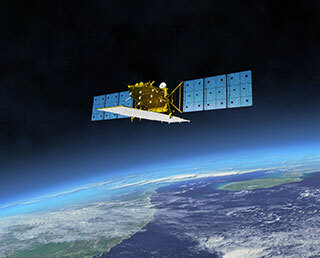 The DAICHI-2's observation data is expected to contribute to understanding damages from a disaster, monitoring deforestation, and more efficiently understanding farming areas. Astronaut Wakata began his long stay at the International Space Station (ISS) on Nov. 7, 2013, as a crewmember of the Expedition mission 38/39, and performed various activities focusing on space environment utilization including ISS operations, system management for each ISS facility including the Japanese Experiment module “Kibo,” and science experiments. During the latter half of his stay as Expedition 39, Astronaut Wakata became the first Asian commander of the ISS and led life on the ISS for 66 days from March 9. Thank you very much for your support to his long stay of about six months. *All dates and times are Japan Standard Time. Astronaut Wakata returning to Earth! Astronaut Wakata is returning to the Earth at around 10:58 a.m. on May 14 after completing his long stay at the International Space Station (ISS) for about six months. JAXA is broadcasting his return trip live through the Internet. We will also offer public viewing services at JAXA offices. Let's support and cheer on his homecoming. 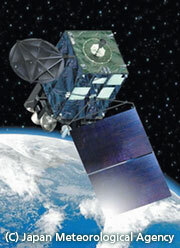 JAXA’s English website was renewed on April 22 (Tue.) with a complete new design. The new content, “Topics in Your Area” showing our global operations is now open for you to find JAXA’s activities in your area. The site URL has been changed as follows. If you have bookmarked the old one, please update it. Sorry for the inconvenience. Please be aware that when you use URLs for the old website, the top page of the new website will automatically open. The latest information about the DAICHI-2 and its launch preparation status will be updated on the DAICHI-2 project page. Astronaut Wakata Koichi, who is in his long-duration stay on board the ISS, has succeeded Russian cosmonaut Oleg Kotov and become the 39th ISS Commander on March 9, 2014. Wakata will take the leadership of the six ISS crewmembers until the day before he leaves the ISS on Soyuz spacecraft (37S/TMA-11M) scheduled around mid-May. Astronaut Koichi Wakata, who is on a long-duration stay as a flight engineer for the 38th expedition mission aboard the International Space Station (ISS), will assume the post of ISS commander for Expedition 39 on March 9. Astronaut Wakata will be the first Japanese ISS commander. 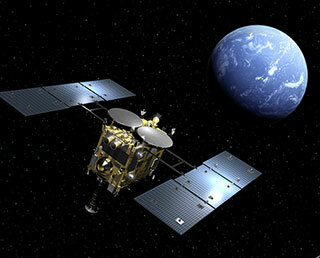 JAXA will broadcast his inauguration ceremony live through the Internet. The program will mainly relay the live ceremony scene from NASA TV while reviewing his past achievements and introducing future missions. Successful launch of H-IIA F 23 with GPM core ovservatory aboard! 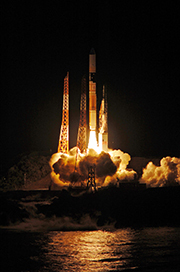 The launch time of the H-IIA Launch Vehicle No. 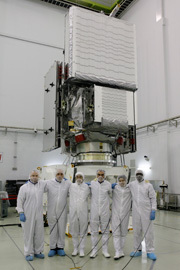 23 with the core observatory for the Global Precipitation Measurement mission onboard was set for 3:37:00 on February 28 (Fri.), 2014 (Japan Standard Time). 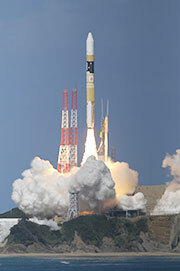 JAXA will begin a live launch broadcast from the Tanegashima Space Center from 2:50 a.m. on the day. You can watch it through the Internet. Please send your support message for the launch on the special website, or tweet it including #GPM JAXA. * The above broadcast schedule is subject to change due to preparations and other factors such as weather. The GPM core observatory will be launched sometime between 3:07 a.m. and 5:07 a.m. on February 28 (Fri.), 2014 (Japan Standard Time). JAXA's live launch broadcast will begin at around 2:20 a.m. on the day from the Tanegashima Space Center. You can watch it through the Internet. Please watch the launch with us in real time! We also welcome your support message for the GPM/DPR. Please send your support message for the launch on the special website, or tweet it including #GPM.